Every Friday, as the weekend looms ahead and we prepare to head back to Tipperary, there are a few things I always prepare for. First and foremost, my father and brother-in-law, who run the farm, will be expecting some baked goods. I’m not sure what it is, maybe being close to the land or working up a proper appetite, but I find no one appreciates home baking as much as farmers. It’s actually nice to make a big batch of something knowing it will be devoured in 48 hours or less. It will be eaten fresh, while it’s still at its peak. When baking for just Patrick and myself, whatever I make will be in the fridge or pantry for several days before we finally finish it or (gasp!) have to throw it out. That’s the nice part about having moved to Ireland. In Toronto, neither of us had any family close by. Working hours are so crazy (and my friends so fabulously successful) that you need to plan weeks in advance to share a proper meal with the ones you love. Here, I know that when the weekend comes, everything I make will be consumed around the kitchen table with our family and it will be appreciated. Buttermilk biscuits are something I grew up on in Cape Breton. My grandma suffered from MS and was in a wheelchair for as far back as I can remember. She lived with me and my family. Grandma was a hard working lady. Back in the day, she had seven kids, the farm animals and my grandpa to look after. They weren’t wealthy by any means, but there were always plenty of baked goodies in the house. When my grandpa died in the 80’s and grandma moved in with my parents a few years later, the baking didn’t stop. I would come home from school every day to freshly baked biscuits – still warm and oozing with jam and butter. She baked plenty of other delicious things, but it was her biscuits she was famous for. When I grew up and moved away from home, I started to miss her (she passed away when I was 15) and her baking tremendously. As I made my way through culinary school and worked my way up in the Toronto restaurant scene, I started to drift away from fine dining and brought my focus back to country cooking. 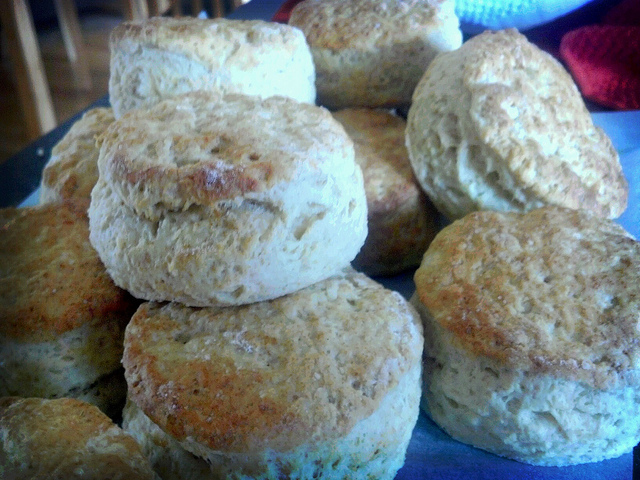 These biscuits were one of the first things I made for my future in-laws when Patrick brought me to Ireland to meet everyone. I think they definitely helped me win them over (thanks Grammie!). Preheat your oven to 400 degrees (or 200 degrees Celsius). Line cookie trays with parchment. In a large bowl, combine the flour, baking powder, salt and sugar (if you’re using honey, mix it into the buttermilk, not the dry ingredients). Add the cubed, cold butter and, using your hands or a pastry cutter, rub the butter into the flour mixture. It should take a few minutes to break up the butter and incorporate it into the flour. When you’ve got a crumbly, dry mixture, it’s ready! 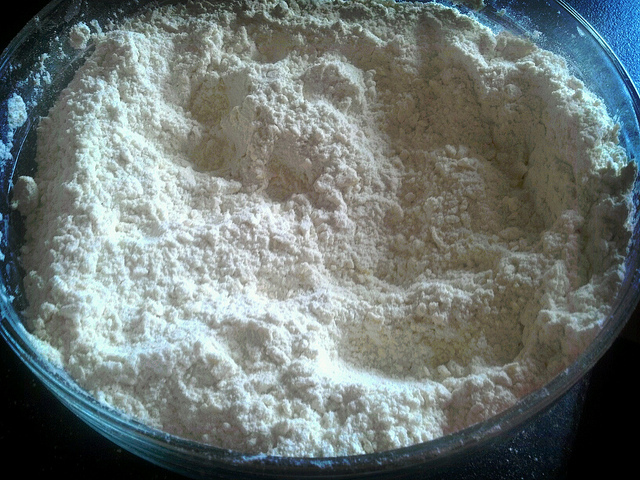 Make a well in the centre of the flour mixture. Add the buttermilk (and honey, if you’re using it) all at once and mix with a wooden spoon until it starts to pull away from the sides of the bowl. Turn dough out onto a floured surface and knead lightly for about one minute – you do not want to overwork the gluten in the flour like you do when you make bread, but you still want the dough to be lightly springy and easy to roll out. If it’s sticky, sprinkle some flour on the surface of the dough while kneading. Roll out the dough to roughly 1.5 inches in thickness. 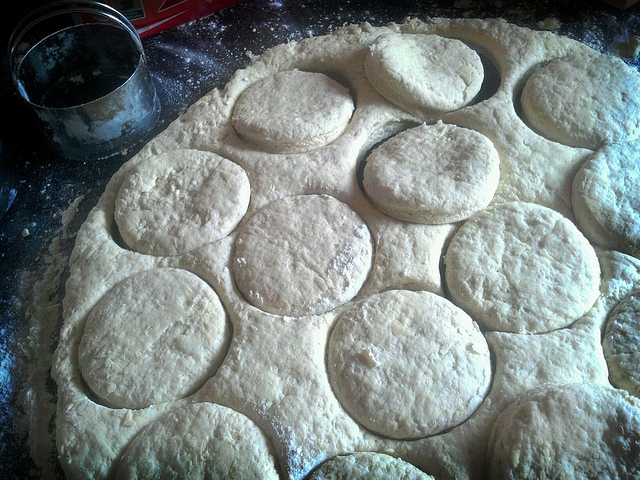 Using round a round cookie cutter or biscuit cutter, cut out your biscuits and place them on the baking tray. Dough can be re-rolled two more times before it becomes too glutinous. 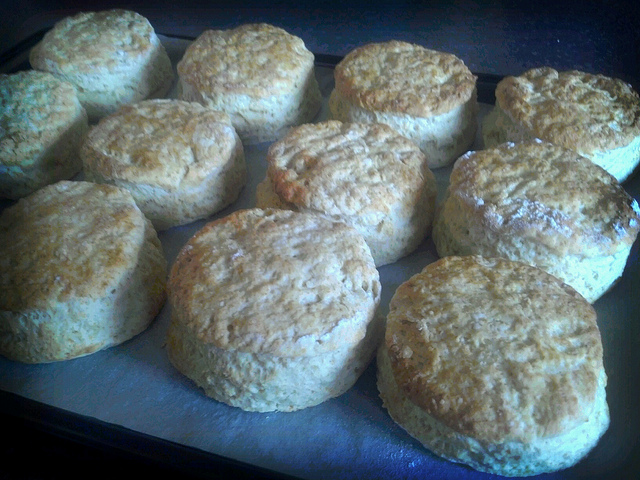 Bake the biscuits for 15-20 minutes. They should rise considerably and be golden brown on both the top and bottom (bake a few more minutes if they’re looking really pale). Serve with fresh butter, homemade jams and preserves, cheeses or clotted cream. They go amazingly well with a hot bowl of seafood chowder or salt cod fish cakes with cottage cheese (which is how we like to enjoy them in Cape Breton!). Looking forward to trying these. I do not have the knack of making a good biscuit. I’ve been trying for years. Love your blog.